Morgan Tsvangirai inspired many in the fight for democracy in Zimbabwe. 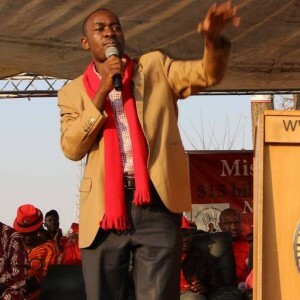 Sadly, the most immediate legacy of the late Movement for Democratic Change-Tsvangirai (MDC-T) leader is a predictable and unseemly succession battle from which the youthful Nelson Chamisa has emerged as victor. The manner in which Chamisa has secured the party presidency is likely to cause considerable damage to the opposition just months before the next general elections, to be held between 22 July and 22 August this year. The MDC-T has always sought to distinguish itself from the ruling Zimbabwe African National Union-Patriotic Front (ZANU-PF) party by campaigning on a platform of non-violence and adherence to the rule of law and constitutionalism. So determining succession to the party presidency should have been a simple matter of applying the party’s constitution. Tsvangirai, however, muddied the waters in July 2016 by appointing two ‘vice presidents’ – Elias Mudzuri and Nelson Chamisa – in addition to the party’s deputy president, Thokozani Khupe, elected by congress in 2014. At the time, Tsvangirai claimed that he had the authority to do so using powers conferred by amendments to the party constitution adopted in 2014. However, the congress of that year merely adopted resolutions that certain amendments should be made. There is no indication that the resolutions were ever effected. And none of the resolutions give the party president the right to appoint additional deputies. Legal proceedings launched to challenge Tsvangirai’s appointments were dismissed on a technicality, because the applicants were not paid-up members of the party. As a result, the constitutionality of the appointment of the additional deputies was not put to the test. The 2011 party constitution provided that in the event of the president’s death, the deputy president assumes the role of acting president, pending an extraordinary congress to elect a new president within a year. On Tsvangirai’s death, each of the three deputies claimed the right to be acting president. It thus became essential to refer to the 2014 version of the party constitution to see if it provided an answer to this conundrum. That proved to be no easy task. The constitution had been removed from the MDC-T website and no one within the party seemed to have a copy, which was either being deliberately concealed or did not exist. Using the 2011 version, Khupe was able to claim that the constitution provided for only one deputy, and by virtue of the constitution she automatically became acting president until the extraordinary congress was held. Chamisa, however, contrived to resolve the legal mess to his advantage. On 15 February this year, a day after Tsvangirai’s death, at a dubiously convened and highly charged meeting of the party’s national council chaired by Chamisa himself, Chamisa was declared acting president and Khupe’s claim was discarded. Presenting himself as acting president at Tsvangirai’s funeral, held at the late president’s rural home five days later, Chamisa inappropriately used the occasion to whip up support for his position among the thousands of party faithful present. This caused considerable discomfort to the foreign dignitaries sharing the platform with him. Chamisa’s supporters then set upon Khupe and others in her company perceived to be against his elevation. The attempt to drive her out of a village hut where she had sought refuge from the baying and violent mob, by lighting the thatch, failed only on account of the damp weather. Chamisa then tried to persuade a sceptical public of the legality of his position. He pointed out that the MDC-T’s national council had the power to resolve this difficulty of who should be appointed acting president if the party had three deputies. His argument however depended entirely on whether the appointment of the two additional deputies was legal in the first place. A document which was supposedly the 2014 version of the party constitution then began circulating on social media. It differed from the 2011 version in that an ‘s’ had been added to ‘deputy president’ in two places. Chamisa used this to justify his assertion that the appointment of the additional deputies was lawful. Other than those two clauses, (the only places where the ‘s’ could be added without requiring a redraft of the whole clause) the constitution refers to ‘deputy president’ (singular) throughout and the clear import is that it is drafted on the basis of there being only one deputy. Chamisa has now taken the stance that there is neither money nor time for the party to convene an extraordinary congress to affirm his position before the elections. He will thus be the party’s presidential candidate by default. Khupe has responded by breaking away and seeking an alliance with smaller opposition parties, with a legal battle looming over the MDC-T name and the party’s share of state-funded political party financing. The MDC-T has campaigned in past elections with the slogan ‘Mugabe must go’ and a promise of economic and democratic reform. Mugabe is gone. The new administration under President Emmerson Mnangagwa has stolen the opposition’s platform of economic reform. All that now distinguishes the MDC-T and ZANU-PF as parties is what remains of the MDC-T’s stated commitment to constitutionalism and non-violence. It is not lost on the electorate that the ugly succession battle and Chamisa’s power grab have blurred these remaining dividing lines.